Celery is a low carb, low-calorie crunchy vegetable that has many health benefits. Consuming celery stalks, celery ribs or celery leaves is extremely good for you. Celery is good for weight loss, lowers blood pressure, promotes good liver health, and helps manage diabetes. Celery is also rich in vitamins, minerals, and antioxidants that help to strengthen your immunity and fight disease. There are many ways of consuming celery to take advantage of its benefits. You can boost your health by making celery juice, add fresh celery sticks and leaves to meals or soups, and crunch on a raw celery stalk for a healthy, low-calorie snack. However you decide to eat this delicious, fibrous vegetable, there are many reasons why celery is good for you. In this article, you will find out about the many health benefits of eating celery. You will also learn how celery seeds, celery leaf, and celery juice can help to keep your heart, liver, and body in good health. Celery (Apium graveolens) is a vegetable that grows in many countries throughout the world. Celery belongs to the Apiaceae family and is closely related to parsley. Celery is known for its long fibrous stalks that are abundant in vitamins and other nutrients. 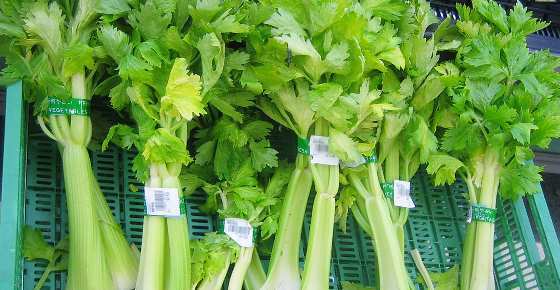 Celery stalks are sometimes referred to as celery sticks or celery ribs, whereas the whole plant is referred to as celery head. Celery heart, on the other hand, is at the core of the celery head and consists of the tender inner stalks of the celery. Celery leaves are also an important edible part of the plant when it comes to treating many ailments naturally. Celery leaves are packed with vitamins and minerals and make a tasty and colorful addition to garnish or flavor many soups, salads and meals. The many health benefits of celery stalks and celery juice come from the fact that celery is rich in nutrients. Another reason why celery is good for weight loss is that it contains plenty of fiber. Two large stalks of celery contain 2 grams of fiber which is 8% of your recommended daily intake (RDI). Munching on a stick or 2 of celery will help to calm hunger pangs between meals without piling on the calories. Celery also has many vitamins that are essential for good health, a strong immune system, and healthy skin. Celery is rich in vitamin K, and contains vitamins A, C, and B-group vitamins. For example, one large celery rib contains 18.7 mcg vitamin K which is 23% of your RDI. The same amount of celery contains 2 mg vitamin C which is 3% of your RDI. Many of the benefits of eating celery are due to its rich mineral content. Celery contains minerals that are good for your bone health, blood, skin, and general health. For example, celery is a good source of potassium, calcium, manganese, magnesium, and phosphorus. Consuming celery sticks and celery leaves can also help reduce inflammation in your body. Find out other proven natural anti-inflammatory foods to include in your diet (science based). Celery is a medicinal plant that can be used as a natural remedy due to its level of antioxidants. Let’s look in more detail at the many benefits of celery sticks and why drinking celery juice can be good for you. Because it is low in calories but high in fiber and nutrients, celery is good to eat if you are on a weight-loss diet. So, eating one or 2 stalks or ribs of celery can be a healthy snack between meals that control feelings of hunger. Learn more about proven ways to lose belly fat based on science, and the reasons to increase daily exercise to boost weight loss. Celery stalks are good for your cardiovascular health if you eat them raw, juice them, or add them to a meal. To help keep your heart health and reduce your risk of a heart attack, find out what foods to include in a cardiac diet. One of the reasons why celery is good for your heart is that it helps to control hypertension. Another way that celery can treat hypertension is because it is diuretic and helps get rid of excess sodium and water from your body. Learn about other natural remedies for high blood pressure to help reduce your risk of a stroke. One of the other ways that celery helps reduce your risk of coronary heart disease is that it helps lower cholesterol. You can include heart-healthy foods in your diet to bring down cholesterol levels naturally and reduce your need for taking medication for cholesterol. Consuming celery juice regularly can help to benefit your liver and reduce the damage that free radicals can cause. You can add celery to the list of healthy foods that help to cleanse your liver. Why not also try a lemon and olive oil liver cleanse to help keep your liver working properly? Celery is high in fiber and is extremely good for your digestive health and to help prevent constipation. If you frequently have abdominal cramping after eating because of a gastric ulcer, find out what are the best foods to eat to reduce ulcers. Celery is a healthy food to eat if you suffer from diabetes because it is low in carbohydrates and high in fiber. Find out what other foods help control blood glucose levels. Because celery is a natural anti-inflammatory food, consuming celery stalks regularly could help manage arthritis symptoms. As well as adding more celery to your diet if you have arthritis, you can learn about other foods for arthritis that help reduce inflammation. One of the celery benefits for men is that celery can boost male sexual health and improve the quality of sperm. You can find out what else you can do to improve the life span of sperm if you are trying to conceive a child. The rich nutritional content of celery ribs and leaves means that celery can help protect brain health. Find out what other foods to include in your diet that promote good cognitive health and can help improve your memory. Celery is one of the foods that should be part of a healthy diet to help reduce the severity of symptoms of the menopause. Of course, increasing your intake of celery during the menopause will boost your health in general. Adding a cup of chopped celery to a salad, stir-fry, or another meal will help you meet your daily nutritional requirements. If you are in your late 40s or 50s, find out how to deal with hot flashes and other symptoms of the menopause. You may also find that some supplements can help to control menopausal symptoms. Celery is a very healthy vegetable that also contains compounds that have chemo-protective properties. Of course, more research has to be done to find out how certain extracts from celery and celery seeds can be used to cure cancer. You can also add both whole and ground celery seeds to your cooking to benefit from their amazing effect on your health. Celery is a healthy vegetable full of goodness, vitamins, minerals, and nutrients that can boost your health. Celery can assist with weight loss, keeping your heart healthy, and lowering blood pressure. Although there are many benefits to celery, there can be some side effects of celery and foods containing celery seed.